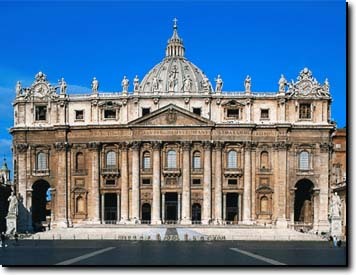 It is the greatest church in the world and is dominated by the imposing Michelangelo's dome. It was built in 324 A.D. by Constantine. The works which give the present shape to the basilica began in 1506 thanks to the Bramante's plan. Placed in the Vatican State (that is an independent State) it dominates St.Peter's Square which is a Bernini's masterpiece. This basilica is the spiritual centre of the Christendom and for its realization many great artists like Bramante, Raffaello, G. from Sangallo, Peruzzi, A. from Sangallo masterly worked. In 1547 Michelangelo joined those artists realizing the apse part and the dome which represents the greatest masonry work never built. Later on, Maderno erected the basilica's façade and, by order of the Pope, changed the Greek cross plan of the church into the current Latin cross. Preceded by an enormous perron, the basilica's façade is characterized by emergent columns between which some windows take place. The largest window, that is the central one, is the blessings loggia. The atrium, realized by Maderno, is decorated with stuccoes and mosaics: among these, Giotto's mosaic "La Navicella" is particularly appealing. Five bronze doors introduce to the basilica; one of these, that is to say " The Saint Door", is open only on the jubilees occasion. The church is imposing and and grandiose: in its middle, under the luminous dome, adorned by mosaics, over the papal altar, you can admire the Bernini's bronze canopy. On its right you can see St. Peter's bronze statue, sculptured by A. di Cambio, having its right foot warn out by the faithful's kisses. In the right aisle there is "La Pietà",the famous Michelangelo's marble complex. In the Apse you can admire the splendid "St. Peter's Chair", a bronze work by Bernini. If you want, you can visit the basilica's dome from where you can enjoy an exceptional view of Rome. Pirro Ligorio (Architetto) dal 1564 effettuò i lavori sulle cupole minori poste intorno a quella maggiore. dal 1573 e in soli due anni costruì la cupola seguendo i disegni di Michelangelo. Giovanni Angelo Braschi said Pope Pio VI (Pontefice) commissionò a Carlo Marchionni la Sacrestia, un edificio esterno alla basilica, i cui lavori furono conclusi nel 1784. Giacomo Manzoni said Manzù (Scultore) con la porta posta all'estrema sinistra realizzata nel 1964 e nota come Porta della Morte poiché da questa porta escono i cortei funebri dei Pontefici. Giuseppe De Fabris (Scultore) con la statua di "San Pietro" che precede la facciata e il monumento a Leone XII del 1835-36 posto nella navata destra. Luciano Minguzzi (Scultore) con la Porta del Bene e del Male realizzata nel periodo 1970-1977. Luigi Amici (Scultore) con la tomba di Gregrorio XVI realizzata nel periodo 1848-1857. Venazio Crocetti (Scultore) con la "Porta dei Sacramenti" dove è rappresentato un angelo che annuncia i sette sacramenti. Donato Di Niccolò dei Bardi said Donatello (Scultore) con il tabernacolo "Deposizione di Cristo con la Madonna, Giuseppe d'Arimatea, santa Maria Maddalena, san Bernardo e san Sebastiano" databile nel periodo 1432 - 1433.